A placement is a play (tesuji) inside the opponent's group without touching other stones. Its aims are many: killing, yose, sacrifice to get sente etc. Of course, it may fail as a speculative invasion. 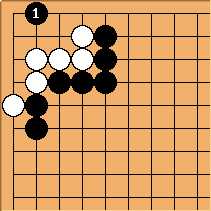 Black has approached White's corner with . 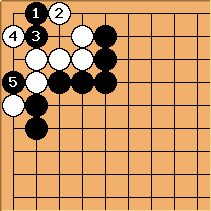 If White does not respond, Black can play the placement of , after which Black can connect out, either at a or at b, turning White either into a drifting group or small life in the corner. The White group is an L+1-group with an extra hane. is a killing placement. 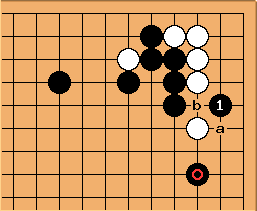 White is dead due to bent four in the corner. makes the second eye false and kills the entire group. In this context we will rather speak of the vital point of the group, or of nakade.